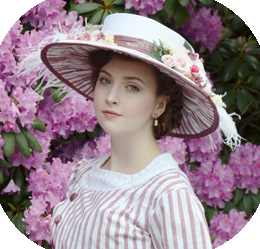 In the past three years I have made over fifty complete costumes, more than twenty hats, and dozens of foundation garments (including corsets, hoop skirts, and petticoats). I draft the vast majority of my own patterns, and am currently working with The McCall Pattern Company to make some of them commercially available. Instead of pursuing college I’ve spent the past three years working from home, improving my sewing skills, and developing a portfolio. My future goals consist of having a job in the costume industry, either as a designer or seamstress. When I’m not sewing, I’m busy sharing my process. I’ve been blogging about my projects since I started sewing back in 2012, and have continued to do so on a weekly basis. I also post videos on youtube that relate to my costume work. In the past five years I’ve acquired a following of almost 350,000 people, and 20 million views between my blog and videos. If you’re interested in seeing more of my work, check out the links below. And for serious inquires, please email me at AngelaCostumery@gmail.com.